New Tinytag Aquatic 2 logger, designed for long-term immersion and underwater temperature monitoring. Gemini Data Loggers has launched the Tinytag Aquatic 2 logger, specifically designed for long-term immersion and underwater temperature monitoring. 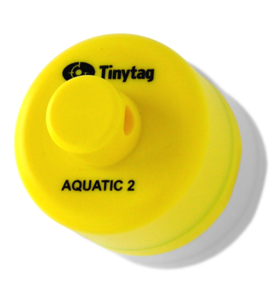 Tinytag Aquatic 2 has the best features of its predecessor, including inductive download that eliminates sockets, and the same Tinytag Explorer Software. However, the new logger has higher resolution (16 bit), giving smoother graph read-outs. The ability to store 32,000 readings is a large improvement from the previous logger, enabling the product to be deployed for longer and allowing faster measurement intervals. The Aquatic 2 logger has a trigger-start capability and visible alarm, making it perfect for monitoring environmental conditions. The logger is waterproof to a depth of 500m, and has a user-replaceable battery which, combined with the robustness of all Tinytags, makes the Aquatic 2 logger durable and built to last. The new logger is compact, lightweight and competitively priced. Housed in a highly visible yellow case which is completely waterproof, the logger has an attachment 'button' to enable it to be secured in place if required. In addition, robust firmware monitors battery condition and provides improved data integrity. All of these benefits now enable more accurate river and ocean monitoring for environmental applications.